Every year, millions of students who may qualify for federal aid to pay for college through the Free Application for Federal Student Aid (FAFSA®) fail to apply for it. Broward County Public Schools (BCPS), the second-largest school district in the state of Florida and the sixth-largest public school system in the United States, is tackling the challenges that prevent students from completing the free application. In recognition of its efforts, BCPS was recently selected to participate in the Third White House Convening on Strengthening School Counseling and College Advising at the University of North Florida in Jacksonville. The convening – held after President Obama’s announcement of changes to the application designed to improve the FAFSA process for students and their families – brought together representatives from more than 30 state college-access and counseling teams including BCPS. The team of Florida school districts worked to create goals and strategies to improve FAFSA completion rates. “FAFSA completion is the primary obstacle for students attending postsecondary education,” says Ralph Aiello, Supervisor of School Counseling, BRACE, & Academic Advisement for Broward County. BCPS will use Naviance by Hobsons to help achieve its goal of increasing the number of students completing the FASFA. District officials plan to ensure that their students have access to key college and career readiness resources to make informed decisions about their futures, including funding sources for postsecondary education. Starting in sixth grade, BCPS students will begin to learn about college and discover how their interests align to career paths. The district also plans to create custom landing pages on its website to host information about the FASFA, school and local events, and external resources. 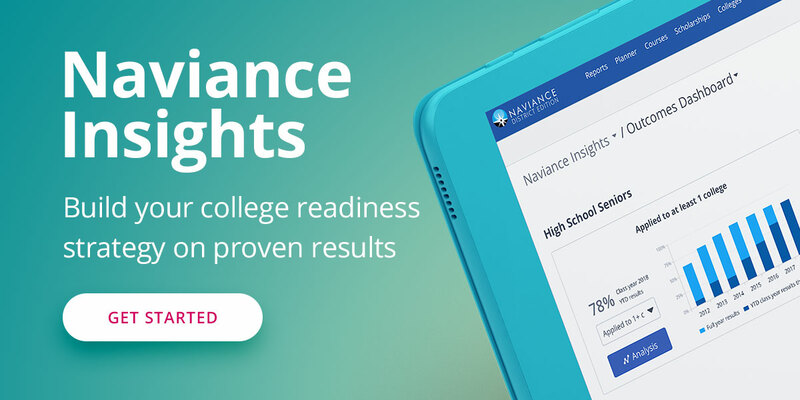 High school students will see personalized notifications about events such as college fairs and scholarship fairs within the Naviance platform to encourage them to take advantage of such opportunities. As with many large public schools districts, BCPS has a counselor-to-student ratio exceeding the American School Counselor Association’s recommended ratio of 1:250. In the 2014-15 school year the ratio for BCPS high schools was 1:525. Naviance will help Broward Advisors for Continuing Education (BRACE) and school counselors with their caseloads by streamlining processes, providing one place to access personalized scholarship information, and helping counselors spend more time working directly with students. BCPS also has launched a number of initiatives to close the access and achievement gap for its students. Events include college application week, a college fair, and ACT administration day in March. The district removes the cost barrier by paying for students to take the ACT and allows students to take the test at school in an environment where they are most comfortable. Broward County Public Schools joins more than 8 million students, including those in 27 major urban school districts such as Houston, Philadelphia, Indianapolis, and Denver, that rely on Naviance to align students’ strengths and interests to their postsecondary goals and to improve student outcomes. To learn more about helping students and their families complete the FAFSA watch our complimentary webinar, “FAFSA Essentials for Counselors”.